It hasn't been easy and it hasn't come without learning from my mistakes and making many sacrifices. 10 years ago I began my career as a "young entrepreneur". At the age of 19 I started cutting lawns and doing anything landscape related that I figured I could learn from. I am super excited to say that my company has developed into what is known today as, PAC Group LTD and we tailor to custom landscape projects that are big or small and commercial snow management. We have provided many services over the years but have found that hardscape designs and innovated landscape creations is what we are truly passionate for. Some people may remember my starter company, "Green Grass Yard Care". The company was a great kick start to where we are today. I started out as a college student in the Social Service Worker program putting my business first and cutting lawns, trimming hedges and some minor residential snow services. I must admit, it wasn't easy. It was labour intensive and very demanding. Anyone paying for the service had expectations I had to live up to. This meant, no more weekend partying and Sunday lounging. I had to hit the ground running and create something for myself and my future since I knew that the Social Service Worker field wasn't my cup of tea. I can admit that those were the days of learning from mistakes. I damaged my first pick up truck while backing up a trailer. I sent the same invoice number to every customer for the first 6 month because I didn't understand my accounting program. I quoted jobs to low which caused me to owe money at the end. I damaged gas lines and water lines. This was all a learning experience that has allowed me to grow my company and most importantly shaped me to be who I am today. Putting my past mistakes behind me and moving forward, 2018 is the year we celebrate 10 years in business and focus on continued growth. I am honored to continue to employ locally, purchase locally, create living spaces for friends and families, bring innovative designs and support our local community through our many initiatives you can find on our "Community Involvement" page. I look forward to meeting new faces and serving our existing and repeat customers. For more information on how I started my company or to start planning your creative landscape space please contact me directly at pac.group@outlook.com or call 705-255-4544. To begin, this subject always makes the hair on Mr. GreenThumb's back stand up and Mr. GreenThumb begins to feel that we are not acting environmentally friendly immediately after reading the subject line. Well, I am not writing to convince you that this product is the way of the world, for everyone or the only landscape option. Both artificial grass and natural have pro and con impacts on our environment but that's not why I am writing this blog. I am writing to educate my followers, friends, customers and potential customers about artificial grass benefits, common questions and cost. Artificial grass has come a long way since invented in the mid 1960's for sporting applications. The grass we use looks to be real, we can get it in 7 different thread heights and comes with a thatch looking thread (that brown layer of grass embedded near the soil to look real) that keeps you wondering if the grass is real or artificial. All of our products come with a 10 year manufacture warranty when installed and maintained by a certified installer. In the business world you constantly hear the term ROI. I was always nervous to ask our financial counterparts what that abbreviation stood for when used. Your ROI is your "Return On Investment" and luckily with this product your ROI is great. The products initial investment is expensive however, when you take all factors into consideration, the value of artificial grass speaks for itself. Not only, will the product last a lifetime, as you wont have to replace it like you would in comparison to sod but you wont have to spend your nights or weekends maintaining your lawn and with the ever growing cost of water consumption you can forget about in ground sprinklers or any water costs. Lastly, you can avoid smuggling your pesticide from the U.S or purchasing the corn feed crap that attracts birds within a 100 kilometer radius. Q: What happens when the dog goes to the washroom on the product and will it smell overtime? A: Artificial grass is perforated which allows for liquid flow to absorb into the gravel compaction layer. You can rinse your turf with water or cleaning products to eliminate any smells which may occur overtime if your dog continues to urinate in the exact same spot (this would happen in any environment). If your pet has a "number 2" on the grass, pick it up like you would regularly do if your pet did that anywhere else. Not to mention, you can say goodbye to those yellow urine spots that you cant seem to get rid of. Q. Can my pet dig through the product? A. Yes, your pet most definitely can. If your pet digs through your lawn now you can expect the same. However, It would be very difficult for your dog to damage the turf or pull it up as it is spiked and fastened around the perimeter. Q. Will the sand/salt and winter debris of Northern Ontario damage the lawn? A. Salt always plays a factor in the longevity of any product including concrete and steel. 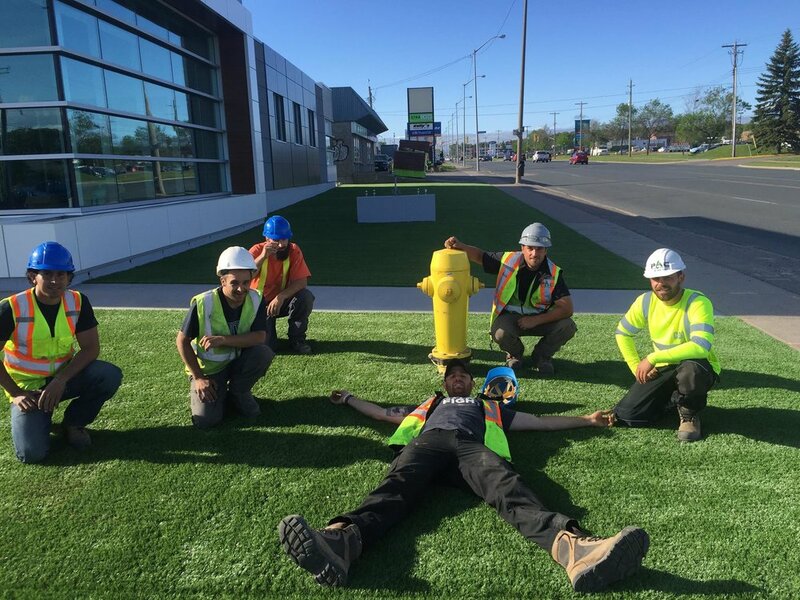 We have had turf installed as a commercial application on the busiest Sault Ste. Marie street and the salt has not caused any damage but does require a spring cleaning every year (just like a regular lawn except with a mechanical sweeping device). Q. What if it the grass becomes damaged from snow services such as plowing? A. This is possible but not likely as we try our best to install the turf at ground level or slightly below. If this does occur we can seam a new piece in with little to no visibility of the seam. Seaming glue products are used and are specific to artificial grass installs. Q. What if someone throws a cigarette on the plastic threading, can it catch fire? A. I love this question because I had the same concern when becoming an installer. To answer the question, no your lawn can not catch fire. The product we install is fire retardant and would take one hell of a fire to cause damage to the product. As previously stated, this product is not for everyone or every landscape application. Some may shy away from the product due to the initial investment cost. Artificial turf does come at a hefty penny. Its a premium landscape product which has been engineered to last a lifetime. Here are my thoughts. The product is relatively expensive and is priced at $12-$17 per square foot. But, its important to consider the included cost of your excavation work, prep, aggregates, install, product and don't forget it comes with a 10 year manufacturer warranty. I personally think this is a great investment idea for commercial spaces that plan on sticking around at the same location for 10 plus years. I also believe that its a great idea for a residential application if you plan on residing in your home for 10 plus years. If this is a new residential or commercial build I highly recommend that you roll that investment into your mortgage. You will get to enjoy the product and reap the benefits as discussed in my ROI rant. After several meetings with our friends at the Garden River Adults in Motion Centre we have finalized our plans. I am excited to share with you what we call, "Project Social Well-Being". The project name has been derived from Garden River Adults in Motions "About" statement, "to provide a first class service and experience that will help enhance ones total social well-being." The aim of this project was to create a holistic design that would connect the school and incorporate land based teaching in this outdoor education environment. Not only will this space be for Adult In Motion but it will be a space for the community to gather for outdoor fires, sporting events and has the potential for any other outdoor social gathering. After a long Northern Ontario winter we are ready to check this project off the list as soon as the snow melts and the frost is out of the ground. Its important to ensure that the frost is out of the ground to avoid any movement, cracking and shifting after our work has commenced. With hopes to begin this project mid May we have finalized our pricing, decided on products to be used, ordered our products and called in for our locates (locates allow for us to know where gas lines, power, water and phone cables are located underground). "Project Social Well-Being" is a total of 1600 square feet of paving stone. We will create a 140 foot long by 5 feet wide walkway starting from the rear exit of the building ending at the entrance of the greenhouse (used for fresh vegetables). The walkway will continue at the rear exit of the greenhouse and end at the garage side door (35ftx5ft). Having a walkway pattern layout prepped and ready for the crew is crucial. If properly planned and materials ordered to spec you can avoid cutting and having waste materials. Our fire pit design will be located at the southeast of the building 75 feet away from the outdoor garden. The total size of the fire pit area will be 20ftx20ft with a 3ftx3ft centered fire pit. Surrounding the fire pit will be custom chairs designed and built by one of our sub-trades. Attached will reside a walkway (60ftx5ft) at the rear of fire pit area leading to the beautiful White Pine smothered bush lot. When meeting with the team at Adult In Motion they stressed how important it was for us to landscape a level ground area with new grass for the kids to play sports. Well, of course we made it happen!!. Situated at the rear of the building lies over 3 acres of unused land. We decided the best place for our 7800 square foot sports and recreational area to be located is between the rear of the building and greenhouse. This area will be excavated, graded and new sod will be installed. We will be using a Canadian made paving stone product called Appian which is manufactured at a facility in Ontario just over 200 kilometers from Sault Ste. Marie. The facility employees over 50 staff and has provided Canada with quality paving stone for over 100 years. The Appian paver will be in a Timberwood colour and have a Blackwood border stone. The fire pit will come from the same manufacture listed above and we will be using a "Kent Fire Pit" system which will be lined with fire rated stackers and an in-lay fire rated steel insert. Our sod will come from a local farm located 15 kilometers outside city limits in Echo Bay, Ontario. The sod is best known as Kentucky Blue Grass. We look forward to keeping you updated as the job progresses. For now, get your shovels out and enjoy the snow. At PAC Group LTD Our Mission Is To Provide Our Customers With Quality Work And Products Before, During And After Each Project. Our Team Wants To Make Your Dream Landscape A Reality While Ensuring Modern Designs That Bring Friends And Family Together For Decades.